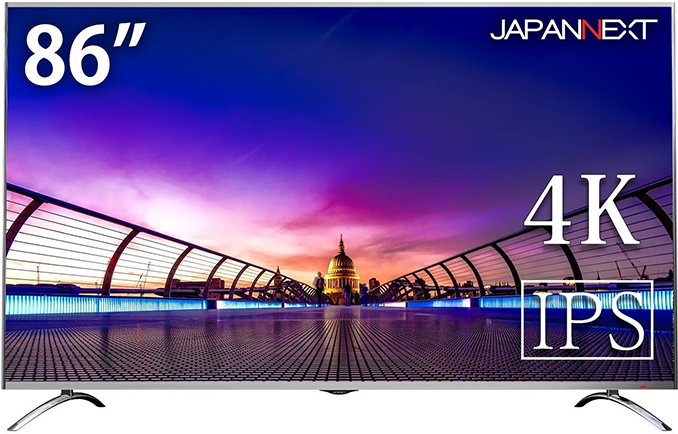 JapanNext 75 and 86-Inch 4K IPS HDR Monitors: What Separates TVs from Monitors, Anyhow? JapanNext claims that the monitors support HDR, but there is no word whether they support HDR10 or other industry-standard transport methods. Meanwhile, firmware of the 75-inch and 86-inch displays feature profiles for 'standard', Games (genre depending), Movies, and Photos. To switch modes and make other adjustments, both monitors come with a remote. Unfortunately, it looks like the LCDs do not support AMD’s FreeSync technology, at least the manufacturer does not advertise the capability. Since we are talking about displays aimed primarily at multimedia enthusiasts, they feature an extremely robust set of connectors to attach multiple devices. The JN-IPS7500UHDR-KG and JN-IPS8600UHDR monitors are equipped with one DisplayPort 1.2, one HDMI 2.0, two HDMI 1.4, and a D-Sub input (just in case someone wants to attach a Windows XP-based PC to an 85-incher to play games from the 1990s - Ed: Or a BMC-equipped server). There is also an S/PDIF optical connector, an audio input, a headphone output, and built-in 5W stereo speakers. "What Separates TVs from Monitors, Anyhow?"